Retrospective with distributed team. Scrum master's story. 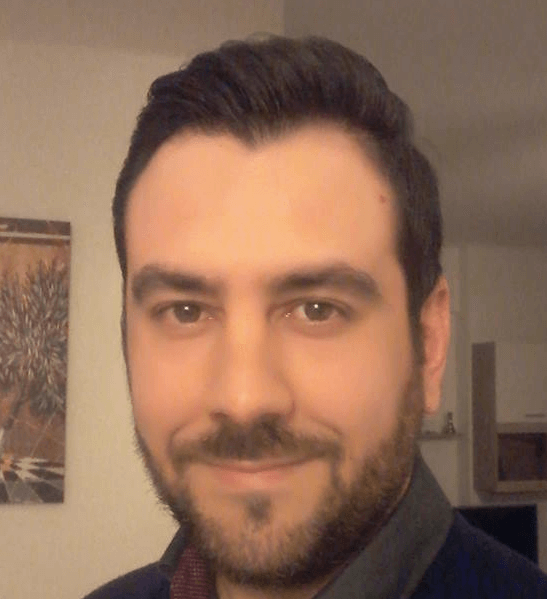 This is a guest post by Nikos Raptis, scrum master, speaker and software developer. Conducting a retrospective is by far one of the most effective tools available and has the potential to inspire tremendous change. Change does not necessarily guarantee success, but having your team gather at intervals to talk about areas of improvement is a great starting point and perhaps the most valuable. How will distributed team members have access to the retrospective games and the procedure in general? How do you maintain transparency and ensure this information remains available even after the retrospective? How do you make sure the retrospective information remains private? To visualize these challenges better, it’s useful to have the retrospective flow in mind, along with the specific team’s needs. This starts by acknowledging the fact that every team will have issues. Often, retrospectives are used to relieve anxiety by openly talking about problems the team is facing. Beyond that, the important output of every retrospective must be to determine actions to address the identified issues. The actions to be taken first must be for the issues with the greatest impact and frequency. This can be visualized using the following board. Using only a few words, team members place notes in the box where their issue fits. 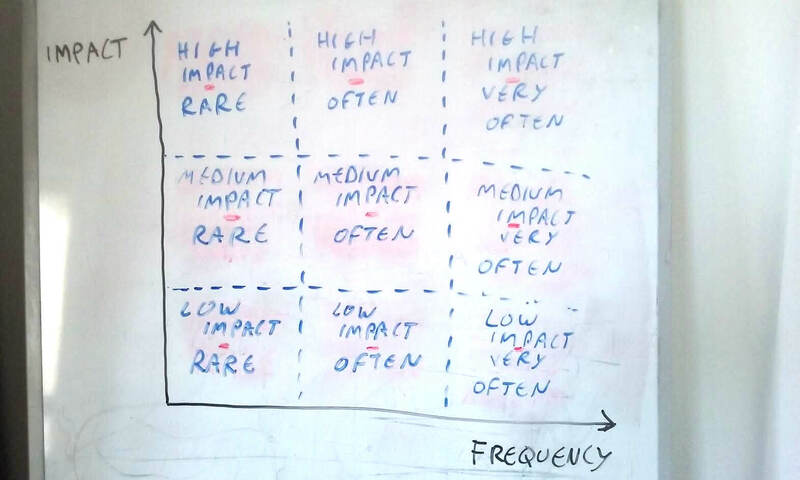 At the top right corner is the ‘high impact’ and ‘very often’ box, and in the bottom left corner is the ‘low impact’ and ‘rare’ box. The team prioritizes the issues noted in the top right corner of the board and moves down to the bottom left, for as long as time permits. Usually teams do not have enough time in the retrospective to deal with all of the items on the board. In this case, notes should be left in place until their corresponding issues are resolved. As mentioned before, the critical part of a retrospective is the action taken. For this, there are several exercises that a team can use. Personally, I prefer the sailboat. The sailboat allows the team to have lots of information about issues and actions. As the image above suggests, the goal/vision can include both long and short-term goals for the team. The rocks represent identified risks, and they may persist for a long time until they are resolved. The anchor represents delaying issues that could derive from the impact/frequency board. 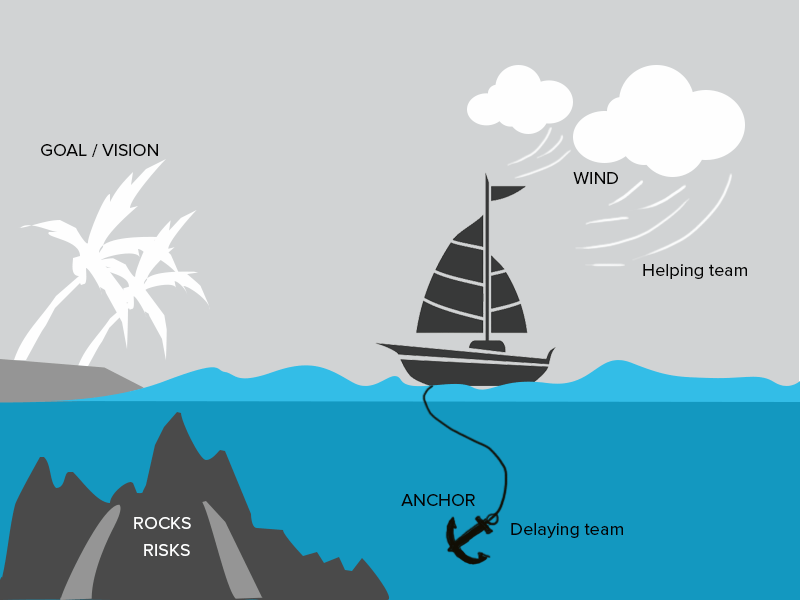 The helping team, represented by the wind in the image, indicates what makes the team perform as it currently does. It can be a good reminder of the helping team’s positive impact, putting wind in the sails. Another thing to notice in both boards is that notes may hang around for many consecutive retrospectives. Undiscussed issues and elements from all areas of the sailboat drawing may carry over from one retrospective to the next. Occasionally, handling the potentially sensitive information on these boards presents no problems. If team members are all in the same place, they don’t have to worry about moving the boards with the two drawings and the crucial information contained on them. Sometimes the boards can be safely secured and stored. However, this is not always feasible. The boards might be needed for something else after the retrospective, or the team may decide that the retrospective information should be kept private and cannot be left for other people to see. Furthermore, if some team members are distributed, then the data on the boards must somehow be visible and accessible to them whenever they need it. These factors can make it challenging to execute retrospectives effectively, but no team should abandon the process because of such issues. A couple years ago, the company I was working for had the same challenges. In the beginning the team was collocated, so we were able to use physical boards in a common meeting room to do our exercises. After each retrospective, I took a picture of both physical boards in order to recreate them along with the drawings. This was time consuming and boring, but necessary because the boards were used again after our retrospective by different teams to do their own retrospectives. Six months later, two new distributed members were added to the team, so we couldn’t continue to conduct our retrospectives in the same way. Somehow, we had to make sure they were seeing the same things and could collaborate by adding notes to the boards. This was when I discovered RealtimeBoard – exactly the tool we needed to solve our issues. RealtimeBoard allowed us to continue using the same exercises, and, since it’s online, anyone could access them from anywhere. We could share the board to any spectator we wanted, to write comments or provide solutions to issues found in the retrospectives. In addition to the various design options that RealtimeBoard has, one important thing for us was that it allowed us to export and store the board’s current status before every retrospective. 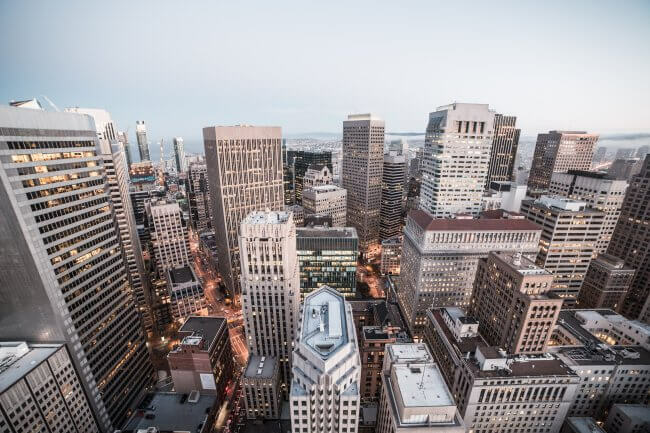 That gave us a history of how things evolved over time, and, after some months, we were able to do an analysis of how we performed in terms of identifying and solving issues. Enable distributed team members to actively participate in the retrospective meetings. Keep all the recorded information from the retrospective online and available for every team member (local or distributed). Prevent people outside the team from having access to the information the team wanted to keep private. Nikos Raptis is a scrum master, speaker and software developer. He loves Agile and Scrum and always tries to implement the Agile principles in every company he works with. He is also a Certified Scrum Master (PSM I), Certified Product Owner (CPO) from scrum.org and Java Certified Professional from Oracle (OCP).